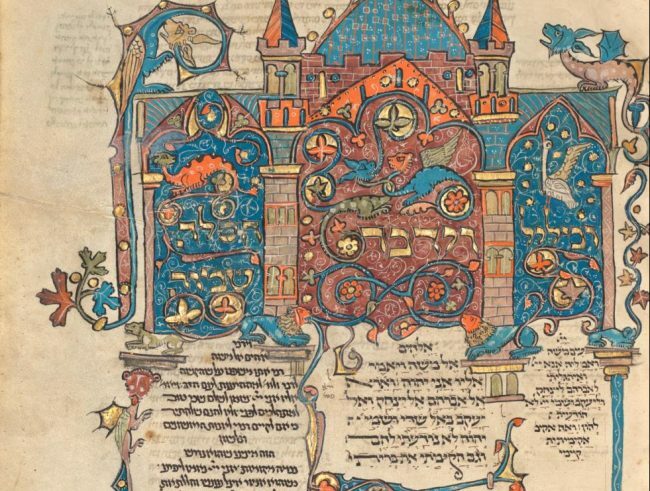 The J. Paul Getty Museum in Los Angeles put one of its newest prized possessions on display: an elaborately illustrated Torah from the Medieval Period. The museum announced the acquisition of the Torah, known as the Rothschild Pentateuch, in July. They put the more than 700-year-old codex on display last week at the Getty Center as part of an exhibit, “Art of Three Faiths: A Torah, a Bible, and a Quran.” On view through Feb. 3, 2019, the gallery features some of the spectacular sacred texts in the museum’s manuscript collection. Created and dated 1296 by an unknown artist, the Rothschild Pentateuch contains the initial five books found in the Hebrew Bible or Torah. It is the only illuminated High Medieval Hebrew manuscript in California and one of very few in the U.S. It is over 1,000 pages, of which approximately 150 are illustrated with either full-page designs, decorative images surrounded the text, or decorative typography. The “Art of Three Faiths” exhibition features sacred texts of the three religions with a common patriarch, Abraham: Judaism, Christianity and Islam. Besides the Torah, they are showcasing a Christian Bible from the Medieval Period in its original binding that features gilded letters to start charters and scribal notes. The exhibit also contains a 10-pages Quran fragment believed to be from 9th Century Tunisia that was penned in fish oil that had gold leaf and ink added. The codices are displayed with detailed close-ups of some of the artworks in them. The three objects in the exhibition are exceptional and beautiful artworks that should spark meaningful dialogue among audiences, according to Elizabeth Morrison, the museum’s senior curator of Manuscripts. The Rothschild Pentateuch is believed to have been crafted for undoubtedly wealthy English émigrés who settled in France or Germany after the Jews were kicked out of England in 1290. They have traced the provenance and journey of the codex, which reflects the journey of the Jewish people during the time. The manuscript spent the 15th century in Italy before travelling to Poland. Baroness Edmond de Rothschild in Germany acquired it during the early 20th century. It was then donated to a library in Frankfurt, where it remained during World War II. After the war, it was given to a Jewish family that immigrated to the U.S. as restitution for land and art taken by the Nazis. Eventually, the family migrated to Israel. They sold it to the Getty, because they wanted it available to the public to see versus remaining in a private institution or collection. The manuscript is in great shape considering its age. The Getty noted there are some stains on pages reflecting spilled drinks over the centuries. Some pages were replaced over the years, including one done in the 15th Century in Italy by Joel ben-Simeon, who signed his work. Lavishly illustrated Hebrew Bibles in book form are extremely rare. Torahs are traditionally in the scroll forms seen in synagogues. In the mid-13th century, however, manuscripts like this one were created and then illuminated by non-Jewish artisans, since Jews were not allowed in the painting guilds. This was only done for a few centuries before the Gutenberg Bible heralded the age of the printed book. The religious texts will be on display as a grouping at the Getty until Feb. 3, 2019. After then, the Getty is likely to find a more permanent location to display its prized Medieval Torah. Decorated Text Page (Book of Exodus) from the Rothschild Pentateuch, France and/or Germany, 1296. Leaf: 10 7/8 x 8 1/4 in. (27.5 x 21 cm). Ms. 116 (2018.43), fol. 130, courtesy of J. Paul Getty Trust.